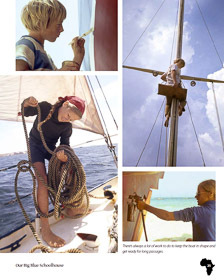 In 1970 Matt Herron, his wife, Jeannine and their children, Matthew 13 and Melissa 11, set sail in their thirty-one-foot sloop Aquarius from New Orleans to the West Coast of Africa. 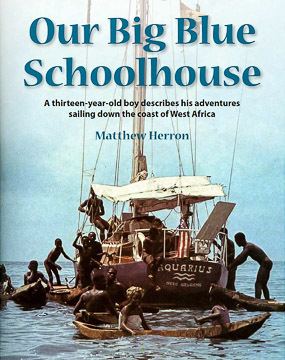 They spent a year and a half at sea, educating the children in the Big Blue (rather than Little Red) Schoolhouse, using the adventures and materials at hand for curriculum. Besides stays in Bermuda, the Azores, and the Canary Islands, the Herrons called at seven countries in West Africa from Mauritania to Ghana, and sailed up three different rivers exploring the interior of Africa. This book is an account of their voyage down the West Coast written by Matthew when he was thirteen. 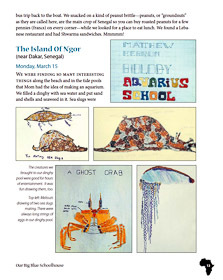 It's an adventure story for Middle School kids, illustrated with Matt's photographs.